Saints record-setting quarterback Drew Brees has his three most productive receiving targets back from last season. The addition of free agent Cameron Meredith and rookie Tre’Quan Smith, combined with the four-game suspension of 2017 rushing leader Mark Ingram, has set the stage for the Saints to revert to a more pass-heavy attack. The 6-foot-3 Meredith is eager to regain his form of two seasons ago, when he was Chicago’s leading receiver. He missed 2017 with torn knee ligaments and also has been limited this preseason. On Wednesday, Meredith practiced fully and said he feels ready to immediately contribute to the offense. “Coming back this year feels great,” Meredith added. 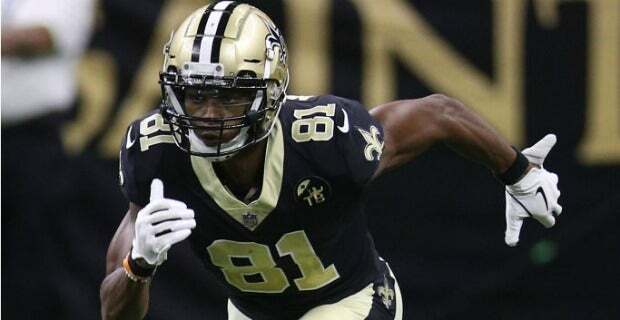 “I just need to pick up where I left off.” It's unclear how big of a role Saints WR Cameron Meredith will play in Week 1 since they also kept fellow slot receiver Austin Carr on their 53-man roster. But it's worth nothing that Meredith was a full participant on the first official practice report Wednesday after recovering from the major knee injury that wiped out his 2017 season with the Bears. Meredith said that is significant as he pointed to the advice that Kobe Bryant gave Gordon Hayward last year – that “if you focus on the mini-milestones along the way, you will find beauty in the struggle.” Meredith also joked that, “I've been asked how I feel about every day for the past year or so,” so he looks forward to a day when that's no longer the case.